Full disclosure: I probably watched five total minutes of Bulls basketball this season. It's probably the first time that has happened since I was 16 years old, living in a suburb of Detroit, only able to catch Bulls games through thick radio static way down the AM dial. Sure, some of it had to do with my recent cable-cutting, but I also don't remember a Bulls team that I was less excited about both pre- and mid-season -- or one that lacked an identity -- as much as this one. This was not the result the front office wanted when it brought in first-year head coach Fred Hoiberg after firing Tom Thibodeau. Thibodeau led the Bulls to a .647 winning percentage in his five seasons as head coach, but also had a contentious relationship with the front office over roster control and minutes limits, among other things. In Hoiberg's defense, it was not all his fault. This is not the kind of roster that plays to his strengths as a coach. He's been given leftovers from the Thibodeau era -- one defined by defensive grit -- and has asked them to play a more offense-oriented game plan with a focus on outside shooting. It was never going to work, but I don't think anyone expected a team with this much talent to play their last game of the season on April 13, even in an improved Eastern Conference. The Bulls are in one of the worst conditions an NBA team can find itself -- knee-deep in mediocrity. They finished the season 42-40, ninth in the Eastern Conference and on the outside looking in at the playoffs for the first time since the 2007-08. The 2007-08 team looked much more like the kind of Bulls roster you'd expect to miss the playoffs. The largest percent of their payroll went to veteran journeyman Larry Hughes, who only played 28 games. It was Joakim Noah's rookie year, but he was sitting behind "the fro," Ben Wallace, who the Bulls had acquired from Detroit. Coached by Scott Skiles, who was fired on Christmas Eve and replaced by Jim Boylen, the rest of the primary roster included Ben Gordon (the team's leading scorer, averaging 18.6 PPG), Luol Deng, Drew Gooden, Andres Nocioni, Joe Smith, Tyrus Thomas, Thabo Sefolosha and Chris Duhan. And don't forget the two common threads they shared with this year's group -- Kirk Hinrich (whom the Bulls traded at the deadline this year) and assistant coach Pete Myers. The only reason the Bulls found any kind of hope and direction after that season was because the stars aligned. They landed the number one overall pick in the 2008 draft - despite a .017 percent chance -- and selected Derrick Rose, who went on the win Rookie of the Year and later an MVP award. Say what you will about Rose lately, he was a franchise-changing player who just struggled with injuries and never made it back to his peak physically or mentally. 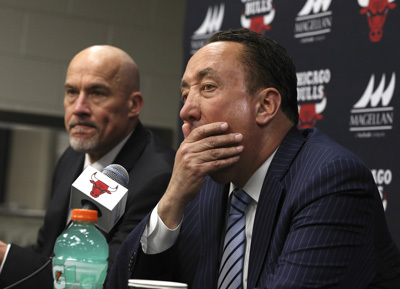 Barring another miracle like that one, the Bulls enter the off-season a team searching desperately for answers with very few resources at their disposal. The Bulls have never been the type of team to tank or clean house, but it's difficult to see the long-term answer on the current roster, and I just don't trust their history luring free agents. The Bulls are just filled with pieces. Jimmy Butler has played like a star at times, and carried them on his back dozens of times, but I'm afraid the chip on his shoulder is becoming too heavy for anyone around him to bear. Some of the pieces are nice, but without major changes, the Bulls don't stand a chance against teams like Toronto, Atlanta, Miami, Charlotte, any team LeBron is on or pretty much anyone in the Western Conference. I didn't skip out on my favorite team of all-time because they weren't good (I've survived plenty of those seasons and rooted for my share of Eddie Robinsons) ;I couldn't watch because there was nothing fun about the Bulls this season. The Bulls would do well to take a few pages out of the Cubs' recent playbook, not only in terms of building for the future, but also in the way the Cubs play the game -- joyfully. There will be very little joy this off-season. The Bulls claim every player is on the table and movable. But unless there is a drastic change in front office or at least in their mentality, we may just need to start praying that those Ping-Pong balls bail us out yet again.